when the nation is celebrating Baisakh, the people in Assam are celebrating Rongali Bihu or Bohag Bihu which marks the new year of Assamese Calendar. The three days Rongali Bihu is the festival of Farmers. The Rongali Bihu celebrated in the villages under a tree along the the bank of Brahamputra while in city like Guwahati Bihu celebrated at Stages and pandals. 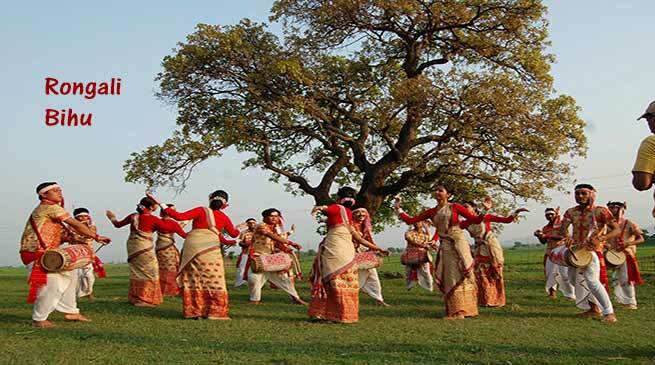 In various Assamese villages, on April 14, the festivities were performed under a tree or in an open field illuminated by burning torches with music produced by buffalo hornpipe and split bamboo musical instrument. On April 14, the day was dedicated to dancing and singing in which young girls and boys took part with great fervour. Younger people visit elders in the family and seek their blessings. Elders give Bihuwan — the traditional Assamese towel known as Gamocha — and bless the younger ones for good health and prosperity. Although the Rongali Bihu is a week-long festival, the celebration continues for the whole of the month and beyond with people organising different cultural programmes and functions in different parts of the state.